Expense! Especially in a diesel car. It’s a bit technical but if the engine is just running on air it can damage the pumps, injectors and other intricate mechanisms of a diesel engine. It needs the lubrication from the diesel fuel to keep it running smoothly. Damage may not show at first but after a while it could cause very expensive problems. Better to just keep the tank at least a quarter full rather than playing Russian Roulette with the fuel gauge. Petrol engines can cope a little better but the damage can still be caused by the build-up of air in the engine. It can prevent the fuel moving around the engine and keeping it running smoothly. Another expensive garage bill. Fuel gauges are not exact. Gauges in petrol tanks are measured by a float which can move and change depending on whether your car is on a hill. So the reading on the dashboard is not 100% accurate. Brakes and power steering. Older cars will fair more easily but in modern cars the power steering will become cumbersome and heavy and will make it difficult to move the car out of the way should the engine suddenly die because of an empty fuel tank. Personal Safety. You’ve no doubt been on the motorway and seen cars and their passengers waiting sadly at the side of the road. Sometimes it’s pouring with rain, sometimes it’s the middle of the night. Breakdowns happen but running out of petrol is something that can be avoided. If you’re going on a long journey make sure your fuel tank is sufficiently full before leaving, check for petrol stations along the way and keep a can of petrol in the boot for emergency top ups. Avoid the dangerous situation of stopping in the middle of a motorway or on a deserted country road in the middle of the night. It can affect your insurance! Call outs for breakdowns are taken into consideration when your premiums are renewed each year. So, how do you preserve fuel? Here are some top tips on driving efficiently. Keep an even speed. 40-50mph (if legal) is the optimum speed. Anything above 60mph starts to use fuel more quickly. Don’t break suddenly and accelerate. This uses more fuel. Don’t freewheel – (coasting out of gear). A lot of modern cars actually use fuel up out of gear. Also, if you are caught by the police you could end up with points on your licence for not being in control of your vehicle. Only switch the car off if you are stationary for a minute or more. Starting the car actually uses up around a minute’s worth of fuel. 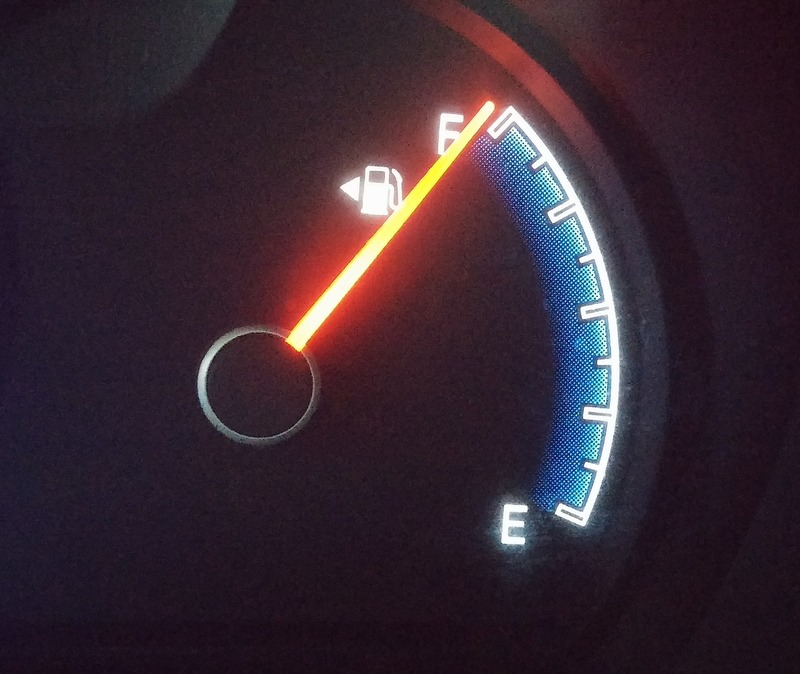 This entry was posted in Uncategorized and tagged car mechanic, dangers of running on empty, fuel tank empty, mechanic, reasons why not to drive with low fuel. Bookmark the permalink. Both comments and trackbacks are currently closed.